A Bike ride with no traffic through the middle of Tallahassee sounds great. How do you manage it? 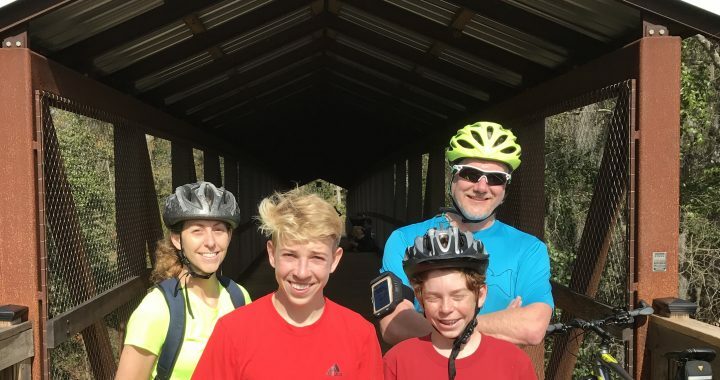 Using great local resources like bikeTallahassee.com and trailahassee.com makes the “how” part manageable. Using the right maps, I planned our route through the city for an urban off-road adventure. I had only ridden about 60% of the trail myself. In all, we used five city parks. McCord Park connects to Winthrop Park with a short off-road path. It doesn’t connect to the other trail directly. 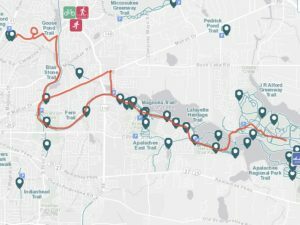 From Governors Park, the continuous trail runs through Tom Brown Park, Lafayette Heritage and eventually to the J Alford Greenway. The path consists of clay, roots and a few sandy patches. Volunteers have made bridges over sections that wash out during storms. I took the lead in this adventure with the very able assistance of Mrs Swanson on sweep detail and scouts Collin and Matthew rounding out our patrol. After a quick safety check for water and helmets, we took our bikes from McCord Park to Governor’s Park using the clearly marked bike lane along Blair Stone Rd. Once at Governor’s Park, we carefully crossed over the railroad track and started to follow the Fern Trail eastward to Tom Brown Park. We enjoyed a quick paved sprint to the shared use portion of Cadillac Trail. If you haven’t ridden this trail before, it’s heavily travelled by cyclists casual walkers and runners. There is a dense leafy canopy overhead and stunningly beautiful views of Lake Piney Z. We eventually made our way over hills and the beautiful bridge picured above to the Greenway. We took in the beautiful expanse of grass lined with trees under that blue sky and rode home with smiles on our faces, sore thighs and big appetites. Our path is marked on the map below. 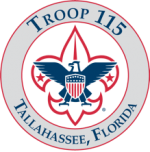 We hope to do this again soon with more of the troop or other local scouts. I hope to see you with us next time. The red trail marks our bike ride between McCord Park and the J Alford Greenway.